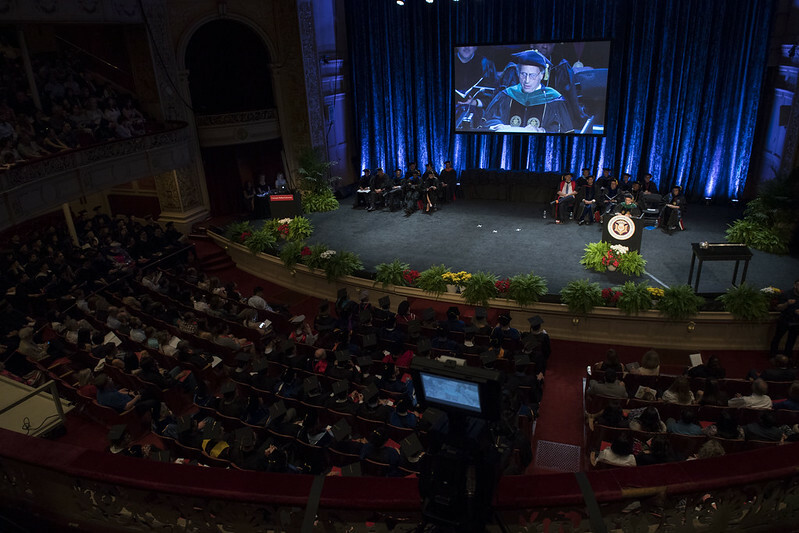 Commencement Speaker Meg Whitman, president and chief executive officer of Hewlett Packard Enterprise, encouraged graduates at Carnegie Mellon University's 120th Commencement to stand for truth, free speech and civility. "This country desperately needs the skills you have developed during your years at Carnegie Mellon University," Whitman told the graduates. "But it needs something more than your skills; it needs your ideals. You leave this great university as better men and women than when you arrived — more knowledgeable and better educated, I'm sure, but I trust wiser and more hopeful." Whitman encouraged the Class of 2017 to be women and men who spend their lives in an objective reality and who have the courage to speak truth to power even when there may be a cost. "If you do — if you are defenders of truth in an age marked by lies — it will have a liberating effect on our fellow citizens and make more possible all good things in life," Whitman said. She also encouraged them to stand up for free speech and welcome dialogue. "Too many of us live in intellectual silos, where we seek out people and information that simply reinforces our existing opinions. Venture out of those silos," she said. "Be the generation that embodies real tolerance, genuine inquiry and authentic open-mindedness." Student speaker Chrystal Thomas received a bachelor's degree in biological sciences and was the first CMU student to be named a Schwarzman Scholar. Thomas attended CMU's Summer Academy for Mathematics and Science prior to college and she shared some of the challenges she overcame. "As someone from a town where high school students thought they couldn't go to college if they didn't have money," she said. "I am immensely proud to be part of the campus and I am so proud to be able to walk with you today." Thomas encouraged her classmates to center their lives around impacting others and to let purpose guide them. "We should reflect on purpose because it develops us, keeps us resilient and can lead us to happiness," said Thomas, who will be pursuing a master's degree in global affairs at Tsinghua University in Beijing. She said happiness comes in three levels: from building something; when others praise what you have built; and when what you have built changes someone's life. Thomas said the third path is the most satisfying. "That path makes you feel the most fulfilled, the path that gives you the greatest happiness — can give you insight on purpose," she said. Alumni Association Board President Deborah Yue urged the new CMU alumni to stay true to themselves. "Continue to be intellectually curious and continue to learn. Be supportive of each other as well as for those who are following in your footsteps. Go outside of your comfort zone and embrace your vision for the future," Yue said. CMU President Subra Suresh told the graduates that those gathered for the day were very proud of their accomplishments. "With a CMU degree you are well prepared to separate signal from noise, fact from fiction and evidence from a mere innuendo. 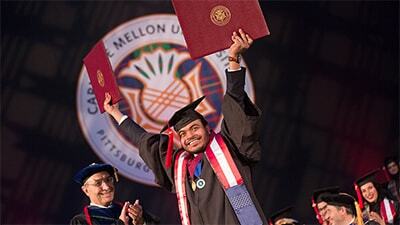 As you accomplish much, we expect you to return to this campus sharing your knowledge and experiences," Suresh said. 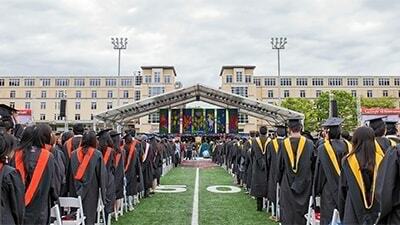 "Whatever you do, where ever you live, you will have a profound impact on the world with a CMU degree. I cannot wait to see how you change the world." He challenged them to think about what they could accomplish and where their paths might lead. "You were my freshman class and so you were my special class of students forever, and with whom I have bonded so much over the past four years," said Suresh, who arrived at CMU four years ago. "I will always be connected with you." Mahzarin R. Banaji, the Richard Clarke Cabot Professor of Social Ethics at Harvard University and a renowned experimental psychologist, received a Doctor of Science and Technology degree. Vivian Davidson Hewitt, who has enjoyed an illustrious career as a prominent librarian and African-American art collector, was awarded a Doctor of Humane Letters degree. She graduated from CMU in 1944. Michael Keaton, a critically acclaimed actor, producer, director and visiting CMU scholar was presented with a Doctor of Fine Arts degree. Bernard Osher, a patron of education and the arts who has pursued a successful career in business, received a Doctor of Humane Letters degree. A total of 4,883 undergraduate and graduate degrees were conferred, which included graduates from CMU programs based in Silicon Valley, Qatar and Rwanda.